I created myself a social networking website. It changed My life Journey entirely..! I made a big profit within a few weeks that I never expected..!! I also got a vast experience in online business that I can’t compare with the money. Using that experience and knowledge now I able to start another online business quickly. Weekly I spend 1 hour at night to write 1 blog post to help people to get online business easy. Because I want to share my story and experience and also you are not my competitors. After writing, every time I am getting a deep breath, I believe that is how The Life. The Social Network Website, That Blinked My Eyes..!! When I was 18-year-old, I read about Facebook founder Mark Zuckerberg. That time, he was the youngest self-made billionaire in the world. I read the full story of Mark Zuckerberg. He launched Facebook at his 19th age. Within 3 years, he became a billionaire. His net worth was grown exponentially, without much efforts like Apple, Microsoft, TCS, Wipro, Infosys, IBM or other big companies. I thought social networking website gives high income without much effort. So I decided to make a social networking website like Facebook, Google Plus, Twitter, Pinterest, LinkedIn, Tumblr etc.. I started to think new ideas, Advantages and disadvantages of Facebook and other popular social networking websites. How I Started To Make a Social Networking Website. This Decision Changed My Life Journey & Its Experience I Can’t Compare With the Money. I read youngest self-made billionaire stories. I read about Mark Zuckerberg more than hundred times. He just launched his website “The Facebook” in his dorm room…! He alone created Social networking website with taking a little help from his friends. So I got high confidence. I can make a social network alone..!! I can manage a company. I wanted to launch my social networking website at my 19th age. Because Mark Zuckerberg was launched at his 19th age…! I got only one year time to achieve my goal..!! Haha.. Looks crazy? But I didn’t know how to code??!!. I met a web designer near to my house. After discussed with him, I realized that I needed, At least, $2000. That time I had no money. So I decided to learn Web Designing. That time I never knew about Website Builders or CMS’s. I understood that I can’t make a social networking website. I needed to learn Asp.net, MySQL, and PHP and more about hosting, online business, SEO etc. Slowly I realized that it is too hard to get success in the social network like businesses. My dreaming and imagination were so powerful. I left all my negative thoughts. I started to learn MySQL and PHP. That time I was searched more for online businesses. I got a good knowledge of Online Marketing, Entrepreneurship, SEO, Starting a company etc. One day, one of my friend, Who is working at Amazon told me about the Website builder and the CMS. Slowly I understood that, no need to learn codes to make a website..!! I created a social networking website within 10 minutes..!! That day I cried an hour. I wasted my life to learn codes. I learned so many tricks, tips, tools. Finally, I made a social networking website according to my new idea within a week..! How I Made Two Social Networking Websites Within a Week Without Codes. Are you confused? I made a social networking site within a day using readymade functions..!. and another one is in just 30 minutes. I also made a step by step tutorial When I was creating my website..!! Now you will get more surprise..!! What is that surprise? You can read that tutorial for Free.!! Yes, you can see for Completely Free.!! Just making social networking website will not give you money. Okay, continue to read my story to know how I made money a few weeks after creating my social networking website. 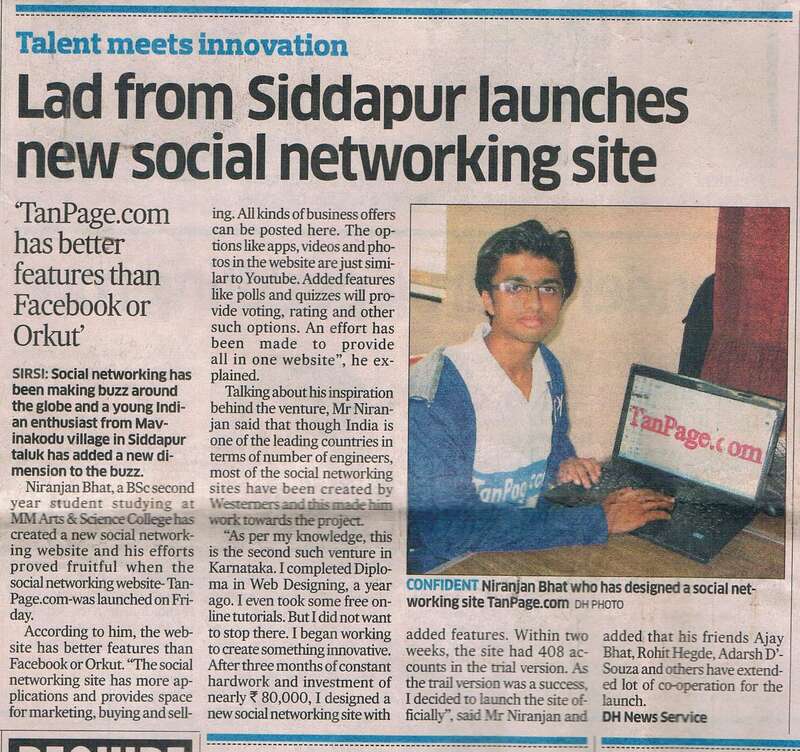 I gave my social networking website’s name as TanPage.com. After creating my “TanPage” social networking website, I got a big problem -How to promote and get visitors to my social network? I never thought about this before creating the website. I told my friends, a few of my friends shared my website link on Facebook. I shared my website link to all other social networks. I got high confident. I started to dreaming, one or another day my website will give a lot of money. I shared my website link to all my social networks like Facebook, Twitter, Google Plus, Instagram, Whatsapp, SnapChat, Line, WeChat and many more. I thought I can get a huge amount of traffic, but slowly I realized that no one is coming to my website…!! I will just click and see. Oh..! Okay if my friends are so close, I may create an account. After that…..What? tomorrow I may Log In, but no liveliness. No one shared anything here. Because in the beginning only a few accounts. So no activities. Slowly I forgot that website. I stopped my imagination.. !! I understood where I m going to wrong. I was upset. But I never gave up myself. I got an idea. I told about my social networking website to the principal of our college and I also requested to get permission to launch my website at College Auditorium in publicly. But he didn’t have a good knowledge of Technology. He rejected my request. How I Turned My Rejections as my Injections..!! I never stopped my efforts. I analyzed, Why every time I got Rejections. I observed a few website opening functions on YouTube. I also read how Mark Zuckerberg launched the Facebook. He launched at his college function hall with all his classmates. I’m a big fan of Mark. I also wanted to launch my social networking website in the same way what Mark did…!!! I collected a few influential people in our town. If they are willing to attend my launch, then Principal believe me & would give me permission to launch my website officially in the college. So I just mentioned a few influenced people with silent behavior, so that if anything goes wrong, then the harmful effect will be minimum. I wrote and printed a letter with all details about my website, how it works, advantages and legal. I also wrote how this is not harmful to the college and society. I gave that letter to the principal. I highlighted how college can get benefit by launching my website. All media will make news about this. So that our college becomes famous. I also succeeded to convince our college management department. Finally, I got permission to launch my website publicly in the college Auditorium. Yess.. I really proud myself, finally I turned all my Rejection as my Injection..!! I also succeeded to get a day to launch as I wish. I took March 9, because, that day, at our college ground a cricket match was there. So that all local media will come to our college. Cricket match usually takes the whole day, but my social networking website launching program will complete in just 1 hour. If I take this advantage, I can get more media and more Audience to my program to our College Auditorium from the cricket audience. I became so happy. I feel happy for all my rejections, because, if I didn’t get any rejection, then I may not come up with the idea to launch publicly..!! I turned all my Rejections as my powerful Injections..!! I shared this news in my friend’s circle. Within no time, this news spreads all over the college. All friends asked me any help needed to launch. I took all advantages. One of my friends named Rohit Hegde came and told me that he had a good knowledge about video editing and he is interested in taking part in my project. He created an introduction video. I met some of my relatives who work in newspapers and other social media. I tried to call our town news press to my social networking website launching function. So that all paper and media will take and publish my website launching news and I can get a lot of advertisement without investment. But I completely failed in this task. I knew if I simply invite to them (I mean as usual), they never come, because I’m just a college boy. So I decided to invite them as a special guest. And I searched some psychological tricks, how to impress others by just doing the simple task and the way to look others. I just searched on Google and saw a few official letters, then I wrote and printed very professionally with the complete information and invitation & invited them. I got a few newspaper editor’s addresses on the internet. I directly went their house and met personally everyone. I invited each one as a special guest..! and I also mentioned that influenced people from my list. All are agreed that they will come to my program. I became so excited. I prepared seminar and all tricks to get the impression from news channels, papers, social media etc. I was fear about my function, because what should I need to do if no one attends? So I just contacted my college G.S and requested him to support me and I got permission to mention my social networking website launching program on the college notice board..! Even though I didn’t satisfy. So I requested to my class teacher to get more audience to my function and also I got an offer that during my social networking website launching program our class will not conduct. Meanwhile, I got few technical problems. Started My Website’s Technical Problems Like a Run In Gum..!! If anyone search for “TanPage” in search engines, my website result link was coming to 3rd. So most of the people were clicking the first and second link. The first and second result will come to another website similar to this name. There is another website called Tanpages.com. this seems at first vision Double X site…!! Full naked girls photos were there. It was very confusing to people. I was so irritated. I wanted to come to my website link at first in Google search results. A few of my friends laughing at me. I feel like really fucked up. How I solved The SEO problem? I write many blogs on my website and gave many links to it. I also suggested my friends, to search Tanpage keyword in their devices and I instructed them to don’t click the first and second result. Click only 3rd result.Do this task many times. Thus I increased click-through rates organically without paying anything…!! So my website rank increased. I also suggested my friends, to sign in different emails in google chrome then search my website name and click the 3rd result. They did this several times with different devices like phone, desktop, tab, their parents, sisters, brothers and relatives phones and other friends devices. I made local SEO in my town. So If anyone typed my website name from locally, Google gives my website to first preference. I requested to search “site:tanpage.com”. So only my website result will come on Google..!! I also instructed my friends to search different string related to my website keyword. For example “some name tanpage.com” So all result came my website only. I requested a few bloggers to link my website with my website name as the anchor text instead of URL. Finally, My website came first within 4 days. In my website, After creating an account, an automatic account confirmation email will send to the user’s email. But this email was going to the spam. I searched how to overcome from this hell spam. But I never got a solution. I distracted heavily. How I solved account verification email spam problem? Suddenly I found Not a Spam option in Gmail. I got an idea. I instructed my close friends, to go spam list and mark TanPage email as not a spam. I came out this problem after only 12 people done this. Ater that my emails started to go directly users inbox. This happened just 1 day before my launching date..! How I Launched My Social Networking Website Publicly Infront Of 1000+ people..!! My most of the ideas were clicked. All attended including principal…!! My all friends were helped me to get more audience. I was really surprised to see that much of a huge audience. The whole auditorium was full. I didn’t observe anything. I took a long breath and started my seminar. In my presentation, I focused mainly these things. Why my social networking website? How you can get more advantages than Facebook or Google+. I also showed my awesome videos. At last, I got a huge support and got long claps from the audience. I was so happy. All teachers and guests are wished me. After my seminar, all media’s took an interview about my social networking website. They asked a few difficult and technical questions. I actually didn’t know answers to those questions. So I answered that we have a team of experts. For any query, you can contact via our company email. So no need to worry about any issue. They stopped me to asking questions. Totally I answered all questions with very satisfactorily. After Launching My Social Network, How I Tucked In The Biggest Victory Of My Life..?!! Next day I really shocked. I got hundreds of greeting and wishes from friend and relatives through Facebook, messages, calls etc. I switched off my phone. I became a celebrity in my college. I also got hot girls. The single day my social networking website TanPage.com got more than 3,500 accounts and 5,00,000 hits. 5,00,000 hits, but only 3,500 accounts. I doubted about my website because it is relatively fewer accounts compared to the hits.I checked the whole website. After the login it automatically logged out my account..! I really shocked. I tried many times. But the same problem continued. He said upgrading the hosting plan is the solution. For upgrading, I needed to spend more money. I had no money at that time. I tried to get some investment. But I didn’t get any investment. I failed to continue my social networking website TanPage.com. So many people are called and complained me that they can’t create their account in TanPage. So many friends made fun of me. But hosting company provider promised 1-year guarantee before I was purchasing the hosting plan. That means minimum 1 year I no need to upgrade with unlimited visitors. So I asked why this happened? Why is the server getting down? They didn’t answer my questions with satisfactorily. Finally, I understand that they hosted in shared hosting and they didn’t give me sufficient space and bandwidth as they promised before. That hosting company is just a local company running by one of my friend’s friend. That’s why I took services from that company. So my dear readers please make sure all features before taking any hosting plan. You need to take care of all hosting features and compare it with few popular hosting company plans. If you want to make any type website the hosting company is very important. At present or in 2018, I highly recommend SiteGround Hosting. It is the best company & got positive reviews. All my websites are hosted here. They give 24X7 free support with chat, phone call, ticket or messages. I need to answer to my parents about the money I wasted (or invested?) for my website. But I never afraid of my money. I went to his office with my friends for supporting me. I asked him, about his failure of the server. I also started to argue that he promised 1-year hosting plan with 100GB storage and 1000GB bandwidth, but within the single day how is it possible to using 1000GB bandwidth? He also promised that 25,000 accounts can able to run this hosting plan. But only 3,500 accounts were created. I also warned him. He agreed with me and he gave all money back. I got a huge amount of traffic. So my website is valuable with high rate. We calculated website valuation. I shocked. The answer is $56,000. Within a week, I made that much of money. But the problem is how to sell a website? It is difficult to sell especially social networking like websites. Finally, I made a deal with him that he will sell my website, instead of that I need to stop spreading bad news about that company. He sold $9,450. Yup..! It is a profit in a week..! But I don’t know how much commission he got. I was somehow happy. I may not succeed in my online business, but I got a lot of experience that money can’t buy. This experience is much more valuable than what I lost. I never worry about people’s comments. Now I’m worrying my next big idea. Hi… I am Jack, Founder/Contributor at WebsitebuilderLy, An entrepreneur with 12 years of Website Creation, Managing, Marketing Experience. Hi bro i read your full story.What i understood of you, about your interest to do for new business for website like facebook. I am very interest to share with you this. I have an idea about the social networking site that is very unique idea. If you contact me i can share my idea while we like us ideas then we will go to star the new business. Thank you for showing your interest in my blog and my story. Yup… If your idea fits my interest, then let’s see. Really thank you for your replay. once we sign in online N.D.A. then i will share you. can you send me i would know what did you made previous another Web apps and applications along with your N.D.A. sheet. Do You Want To See Awesome Award Winning Web Designs 2018? (With Easy Tutorials) Explore Now! Do You Want To Create An Amazing Website? Download The Premium eBook For FREE! Enroll The Course For FREE! Get The Premium eBook For FREE!